A long drone, a long expiration twisted and filled of suffers and of iodine invades our ears as soon as the first seconds of "Cepheids" drill the silence. Tears of synths, little as celestial sighs, moderate this approach psychotronique whereas some delicate steps of sequences soar an imaginary staircase. We hear wooden lapping behind, as well as tablecloths of voice, giving a seraphic depth to the first minutes of "Cepheids" which spreads its armor of ambient rhythm with a delicate swing of the pendulum which makes slowly its sequences oscillate in mists of ivory. This tick-tock takes the form of a soft intersidereal gallop on which is only missing a concrete momentum while that synth layers establish a climate of peace of mind. The movement of sequences get loose from the anesthesia approach of the movement, tracing a circular rhythm which oscillates with more heaviness, even with a little more speed, in a pattern which will call back at some of you the structure of Vermillion Sands by Chris Franke. Moreover it's what jumps at ears in listening to “Stars”; the similarity between the Italian synthesist and the sequenced harmonies, and also the patterns of rhythms, of Tangerine Dream's former member. And it's even more perceptible in the very beautiful "Stars' Sounds" and its 1st part, rather ambiosphérique, which is filled of romance and of melancholy and where the electronic percussions and the hopping sequences bicker the 2nd part under good solos which enfold the flavors of Pacific Coast Highway. 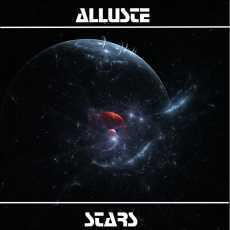 Alluste crosses a new stage with “Stars”. The one who liked, he always likes them, an electronic approach centered on the movements of sequences, so much at the level of the rhythms as the harmonies, aims here at an album where synths are more dominant with very good solos and also with good effects which flirt with a universe favorable for an overflowing imagination. With very ambiospherical introductions and rhythms which progress with their twins and float in the drizzle of the cosmos, Alluste offers a decoration which is as much lunar as organic besides touching aptly this interlude where Tangerine Dream traded the analogue for the digital technology. It's thus that the flavors of the Jive period are drifting with those which guided the first steps of Chris Franke in solo. “Stars” is evidently bound to cosmos. And it's doubtless the most ambiocosmic work of the Italian synthesist to date with a great deal of ambient rhythms which seem all arise from the depths of the cosmos in order to spread their protean figures in atmospheres which are not very far from the ambient psychotronic art. The opening of "Luminous Sphere of Plasma" entails us in a kind of cosmic forest where lives in recluse an insectivorous fauna which develops a concert of drones for very juicy larynx. Fluorescent synth layers lay down their anesthetizing veils, while far off beatings of wings and/or muffled explosions awaken a carousel of sequenced keys which swirls very awkwardly. Other keys, more musical, join this ambient ballet which suddenly radiates of one thousand colors with this thick cloud of sequences to tones and jumps dissimilar which trains a cell of ambient rhythm under a dense coat of synth with, now, celestial harmonies. It's a good ambient rhythm which, in spite of a subtle hatching of swiftness, respects the signature of Alluste's movements of sequences in spiral. The same goes for "Euclida" where the sequences sound like harmonies pinched with a sort of guitar. The arrangements and the cosmic particles always make very Software while the harmonies bring out irreparably TD's Underwater Sunlight period. The movement remains ambient, in spite of its ritornellos of circular rhythms, with threadlike serpentines which spread bouquets of synth to the aromas psychotroniques; new elements of charm in this last album of the Italian synth man. We stay in the field of the ambient rhythms, cosmic drifting rhythms, with a slowly spiral structure which releases strands of sequences which delicately vary the beatings of their keys in the dense ambiocosmic shroud of "Dying Star". I like this way Alluste plays with the reflections of his sequenced rhythms. That creates a deep impression, both at the level of the rhythms than of these melodies embroidered in sequences. Here, the movement adopts a long delicately stroboscopic route to which is grafted astral voices and lines of glittered sequences which flow as a shower of quiet prism. "Eclipsing Binaries" stands out with its immediate structure of rhythm which makes do a rodeo to rebel keys. The line of sequence makes long loops, unfasten its keys which turn into a form of syncopated circle. Layers of synth, filled of nasal cosmic harmonies, spread sonic perfumes of the Hyperborea period, burying this rodeo which waves like a big worm of sands before that the swiftness gets a hold on "Eclipsing Binaries". Bass percussions and wooden jingles surround the quicker march of the sequenced keys while that soft solos perfume our ears of very electronic airs and that wide layers always maintain to the music the very cosmic spirit of “Stars”, a very nice album of EM which wins in interest at every new listening. The sign of a mature composer who enjoys getting out of his comfort zone!